Star ring in assorted colors. Interesting texture with lots of nooks for your FIDs tongue explorations. Be creative, take a few ParroTraps and shove through the center for a foot toy with more texture and chewing delight! 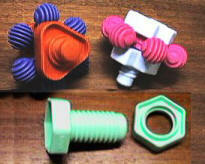 Or place a star ring in the middle of a nut and bolt for even more options!